John Lege - That Guy with the Birds! We said goodbye to John Lege Thursday March 17th 2016. The celebration of life service was lead by Norm Connors of Curran-Schaffer funeral home and what an awesome job he did. I asked Norm if I could have a copy of his speech to share with all of John's fans and followers. Below is what he wrote. Thank you Norm for such a beautiful tribute. That our grateful heart’s will treasure. Over the last few days, stories about John “Buddy” Lege have been pouring in from all over the world. To his family, John was always there in good times and bad, as they were for him. To his close friends, John was the man you always wanted by your side, and could count on to be there. To bird lovers, John was a hero, changing the lives of so many feathered friends, it’s actually hard to count. 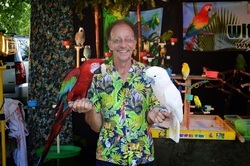 To the public, John was That Guy With The Birds, known for his fun shows all over Western Pennsylvania, and all over the country. To me, John was a lot of those things. I first met John in Avonmore at the Harvest Jubilee back in 2011. We spoke a good while that day, and he shared his story about his passion for his birds. I was amazed, but never realized that our paths would cross on many occasions over the next few years. Since that day in October, John and I have spent time together laughing, crying, and celebrating the lives of his dad, mother and father in law, and brother-in-law as well. I saw John about six weeks ago here at the funeral home, and shared a hug, and a smile. I knew things weren’t good, but when I received the message from sister-in-law Beth Plazio on Saturday, I admit I was taken back a bit. Just 24 hours later, John’s spirit decided it was simply too strong for his body, and off he flew to be with his loved ones that have passed away before him, and Harley and Gunner and the other feathered friends he cared for in this life. Often times during Celebrations, I quote the legendary song, “Somewhere Over The Rainbow”. Today, it has never been more appropriate. The exploding colors on the front of John’s Memorial Folders. The Rainbow Bridge that I’m sure many of you are familiar with when it comes to the passing of a beloved pet. While we are mourning his passing here on Earth, celebrations were taking place in Heaven, over that rainbow bridge. And John, a good soul, a great man, and a hero to all, is in paradise, awaiting the day when we all are reunited. I know many know him as That Guy With The Birds. But today, we are celebrating The Incredible John Buddy Lege. His story begins many years ago when John J. Lege met Betty Luscis at a dance at the Owls where John was playing. The couple married on Tuesday, April 3, 1951 at St. Gertrude’s Catholic Church, and had five children, Joe, born on May 1, 1952, John “Buddy” Lege on September 30, 1953, Jimmy on October 6, 1955, Julie on August 14, 1958, and Jesse, on July 7, 1960. The John, “Buddy” we are celebrating today, shares his birthday with American author Truman Capote, and American Jazz drummer and Band Leader Buddy Rich. The first thing I asked the family is how John ended up with the nickname “Buddy”. They explained there were two reasons. First, of course, there were two John’s in the house, dad and son. It would be hard to call the name, and not have both respond. Also, brother Joe considered John his little Buddy, so hence the nickname was born. The siblings shared that as soon as mother Betty would pull away to go grocery shopping when they were kids, brother John would yell out, “Ding Ding Ding”. It was studio wrestling time, as he was a huge fan of the good old days of pro wrestling with favorites George The Animal Steele, Bruno Sammartino, and Dominic Denucci. John would go into the bathroom, and come out with a towel wrapped around his head. He’d wrestle with his siblings, and it was mostly fun times unless one of them ended up crying due to rug burns. John would beg his siblings not to tell their mother if they were hurt. The siblings shared that brother John was the one they ran to for fun. And he always delivered. That was the Incredible John Buddy Lege. He was an amazing musician, which should come as no shock given his father’s talent. John played in the school band at Kiski, and what blew me away was that throughout his life, he couldn’t read music. But John would hear a sound, and replicate it. He played drums in the school band, but could also play the trombone, sax, banjo, and guitar. His father was incredibly skilled with the accordion, playing since the age of seven. In the mid 60’s, The John Lege Combo was formed, with son Joe on the accordion, and son John playing the drums, and more recently the banjo. Just a few years ago, I had the privilege of having a Celebration of Life for his father John. Son John shared a lot of great memories about his father at that time. One of his first with the band was playing Scotty’s on New Years Eve in 1966 when he was just 13 years old. And an incredible lesson his father taught them so long ago when they were young: you put on the same show no matter who it was for. Just because someone couldn’t afford it, it doesn’t make them any different. It was the appreciation for the music, both by those playing it, and those taking it in, that counted. John Buddy Lege never forgot his father’s words, and applied the same reasoning to his work with his beloved birds. He also remembered his first drum set his parents bought as a Christmas gift when he was thirteen. A set he still has to his day. John continued his love of music throughout his life as member of the bands The Valaire’s, Magic, Elements, and Easy Street. Someone mentioned to me yesterday that none of the members of Easy Street knew how to read music, but had an acute ear for tones and beats. A talented musician. That was the Incredible John Buddy Lege. He served our country with the United States Navy, and was a proud veteran. John worked as an electrician on the boat, and used to tell a story about a day when there was a huge pole on the ship he was on. The light burned out at the top, and not one of the electricians onboard would climb up to change the bulb. No one. Except John Buddy Lege. And the crazy part is he was terrified of heights. He was the recipient of the National Defense Service Medal, the Vietnam Service Medal, and the Vietnam Campaign Medal. John was always bothered by the way he and other veterans were treated when they come home from that war. Well today, John, we will honor your service to our country with military honors accorded by the Armstrong County American Legion Honor Guard. An American Hero. That was the Incredible John Buddy Lege. John married a Glenna Stitt, and had a daughter, Michele Suzann, born on November 28, 1973. The couple parted, and John married an Elizabeth Karen Stockdale, and had a daughter Kayla. The couple parted as well. I asked Linda how she and John met. She explained they met on January 28, 1976, as she and former husband Randy used to run around with Buddy and Glenna. John and Linda ended up getting together 18 years ago, and were married on July 7, 2006 at Linda’s parents, Tom and Donna Mahaffey’s on Sawyer Lane here in Apollo, in a service conducted by Reverend Kathy Taylor. You may have seen some of the pictures from that day on the video tribute. They didn’t just had a wedding, John and Linda had a Luau. What a great memory that must be for your family. John had a great relationship with step daughter Amanda, and step son Matthew, who is disabled. Linda shared that because of Matthew’s condition, he doesn’t respond to people. Except for two, her father Tom Mahaffey, and John Buddy Lege. Here a few things you may not know about John. Linda shared they usually ate out a lot, as neither of them did much cooking. They would go to the former Carpenteri’s, Garda’s, the Villa in Cadogan, and the Yak Diner in North Apollo, where Linda said she and Buddy would stop five days a week for breakfast and dinner. A friendship was born with the owner of the Yak, Deborah Pugsley, who owns four African Grey parrots. John absolutely loved going to Pirmanti Brothers for their Roast Beef sammich, something Linda hated, as she didn’t like soggy food or their cole slaw. But his favorite food was pizza, and John loved going to Dommy’s in Vandergrift for their delicious creations. And there was beady eggs, a Lege family tradition. These were eggs that were beaten with a mixer until they were foamy. And coffee, I can’t forget coffee. Sister Julie shared she thinks they had coffee in their baby bottles. Linda shared that John drank coffee all day long, and each night before bed, he’d enjoy coffee with cereal in it. Another Lege tradition. And John loved Mountain Dew as well. A lover of what in my mind is “fine food”. That was the Incredible John Buddy Lege. Linda told me John loved watching any of the classic black and white programs, including Chiller Theatre, Vincent Price movies, and his favorite, The 3 Stooges. That doesn’t surprise me given how much he liked to laugh. John liked watching NASCAR, and cheering for his favorite drivers, David Pearson and Neil Bonnett. He also enjoyed more recent programs such as The Barret Jackson Auto Auction, American Pickers, and Pawn Stars. For movies, John preferred action or comedies, but liked mostly everything, except chick flicks. I found out yesterday that John was a good at impressions as well, with his favorites Myron Cope and Richard Simmons. He was excellent at Karaoke (no shock there) and would sing Elvis, and Linda’s favorite, Willie Nelson. Music was a part of his entire life. Julie told me when they were young, John would tilt a vinyl record album sideways, and when she would ask her brother what he was doing, he told her he was reading the words to the songs. John loved listening to Big Band music from the 50’s and 60’s, as well as all kinds of music, including artists you wouldn’t think such as Celtic Women, and Calypso music as well. He was so excited when they bought their 2014 Ford Expedition. Yes it’s a nice car, but John was excited about Sirius Satellite Radio, and the channels that featured the music he loved from the 50’s and 60’s. Something else I found out yesterday- John was an accomplished magician. He went to magic school with Jim Richey, and learned the craft. John would put on shows for friends and family, and incorporated magic into his acts with the birds. Linda told me she didn’t like watching magic shows on t.v. with John, as he would tell how they did all of the tricks. Friend Ken, John’s right hand man, told me that one time on a trip back from Detroit, they were on the Pennsylvania Turnpike, and the subject of magic came up. John talked so much about this passion, they two of them lost track of time, and what they were doing, and ended up running out of gas. A real character. That was the Incredible John Buddy Lege. John’s work career saw him employed as an Electrician for Joe Rametta Electric for many years, and later working as a parts manager for Charapp Ford in Natrona Heights, a salesman at Key Lincoln in New Kensington, and for Sterling Auto Parts also in New Ken. Sometime in the early 80’s, John became involved with rescuing parrots. For the last 40 years, he took in feathered friends that were no longer able to be cared for by other families. Linda told me that at one point, the couple had 138 rescued birds. John also loved his dogs. Some time after his Irish Setter passed away, he contacted Linda about a new Setter that he wanted to rescue, as the dog was to be euthanized. When Linda made it home from her job at Indiana Regional Medical Center, she saw it in her husband’s face that he was undaunted. John wanted that dog. So Linda told him to leave right now before she changed her mind. John called his wife on the way back from the shelter, and explained that Shiloh, had the most gorgeous feathers. Linda was thinking, what, another bird? But John explained that the hair on Setter’s are called feathers. John and Shiloh became very close. From Diane Gorham- My daughter and four grand dolls had the time of their lives meeting you and your birds. They talked and talked about Buddy and his birds for days to come, and we have photos to cherish for many years. Looking forward to meeting you in heaven one sweet day. From Sara Ritter- John will be missed. Every time we go anywhere, my little ones always looked for That Guy With the Birds. He was such a delightful person, and always talked to the children, not at them, and included them in letting them touch, and hold birds. From Holly Weaver- John was always interesting and fun to talk to at his shows. I first met him at Bird Paradise’s Parrot Palozza when he sang his tribute for Alex the African Grey to Irene Pepperberg. He gave information in the kindest way, and I learned a lot from the few times I was privileged to talk to him. From Liza Calfo- John gave so much joy with the many fascinating bird shows he did all over the world. He will be truly missed and remembered. From Kristen Miller- I am grateful that I was able to meet him at the Lancaster Bird Expo. It is amazing what John did with his parrots. Thank you John for all you have done for Parrots and enriching so many people’s lives by educating people of your passion. From Anne Oyler- John was my hero. He made the world a better place. He made a difference and touched so many lives, both human and animal, with his kindness and love. I am so proud to have known him. From Kenny and Vivian Shaeffer- We will never forget John in the summer, outside, walking around with the birds, their visits, and learning their stories. We will always remember the life and light John brought to so many. The neighborhood has become a notably quieter place. We’ll miss him. From Deb and the Yak Diner- And with the banjos strumming, at the drums beating that Easy Street Beat, and the parrots yelling with joy our friend John was welcomed home. And God said- this is all quite good. From John’s daughter Michele- she wanted to let everyone know how happy she was to have reconnected with her father about 10 years ago. She figured out where her curly hair, and passion for music, pizza, and ravioli’s came from. And her father’s biggest passion of all- Live for the moment. From his right hand man, Kenny & Sue Sprouse- My friend, my mentor, my hero. I hope that I can be half as amazing as you were “Buddy”. The thing I will miss the most- When he would call me or see me in person, his first words were always, “Whada Ya know Dadio”. Rest in Peace pal, I know that you are taking care of Harley and Gunner up there for us. Linda wanted me to let everyone know that Kenny and Sue are going to step up to help her with the birds, and Kenny will continue the shows so many are so fond of. I encourage all of you here today to go on our website, and read the many memories shared by the great man. Sadly, after a nine month battle with bladder cancer, John’s journey on this Earth came to an end. A loving husband, father, stepfather, grandfather, son, brother, uncle, and friend. An American hero, a hero to his family and friends, a hero to animals, a hero to all. That was, no, that is the Incredible John Buddy Lege. And now a closing poem, that was featured at the end of his video. While the poem is meant for birds, I think it applies to John as well. John “Buddy” Lege. You put a smile on our faces. You always left your trace, and always had a smile on your face as well. We can feel your presence here today, and will always miss you. But someday, we will be reunited again, as you now are, with your friends and family and your beloved birds. The family may be familiar with the poem I use often at the end of services. I used the one I just read instead, but I want to quote the last sentence of the poem I sometimes read. It says- We could cry, close our mind, by empty and turn our back. Or we could do what John would want: smile, open your eyes, love, and go on. If you have had the opportunity to see one of John's amazing shows and would like to leave us a comment, please click here.